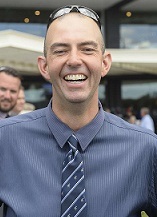 Trainer Jason Coyle doesn’t fear the second-up syndrome with White Moss as the striking grey takes a step closer to her Group 1 mission at Hawkesbury on Saturday. Trainer Jason Coyle is confident White Moss will fire at Hawkesbury on Saturday. (Pic: Bradley Photos). And why would he? White Moss is unbeaten second-up but Coyle concedes the four-year-old’s first-up placing at Randwick two weeks ago had the potential to knock her around. But the Warwick Farm trainer said the mare has bounced through the run and can only expect her to fire in the Group 3 $175,000 Godolphin Crown (1300m). “There’s always that query of second-up runs but generally she races quite well first and second-up,’’ Coyle said. “She’s offered nothing to me to say she’s a little bit flat, we didn’t do anything with her the week after the run and she has been very strong in her work since. White Moss was asked to do all the chasing when third behind the free running Quilista in the Sapphire Stakes (1200m) at Randwick. Punters Intel revealed her last 600m was 34.12, faster than the winner by half a second but being first-up the damage was done early. She ran the second fastest first 200m (13.96), third fastest 1000m-800m (10.70) and third fastest 800m-600m (10.79). “Last preparation she’d only had the one trial and was able to win first-up in lesser grade, this time we gave her two which had her forward enough to perform well,’’ Coyle said. “She was always going to take benefit from that run. There’s been support for White Moss with TAB, firming from $6 to $5 on Friday morning. Coyle is eyeing the Group 1 Tattersall’s Tiara (1400m) in Brisbane and is tossing up which path to take after Saturday. The Dark Jewel Classic at Scone on May 12 is an option though he’s leaning towards missing that race with White Moss and sending stablemate Siren’s Fury there instead. Siren’s Fury is second emergency for the Godolphin Crown but Coyle said he might start her in the Blakes Marine Handicap (1300m) in an effort to increase her 76 rating. “It’s a really strong Godolphin Crown, ideally I want her second-up at Scone if we can jag a start,’’ he said. “If we did secure a start (on Saturday) we’ll look at it but I want to get a bit of prizemoney and up the benchmark if I can because at the moment we’re probably borderline being balloted again. Siren’s Fury is $34 in the Godolphin Crown but a $15 chance in the restricted race. Coyle said he could make a case for both his runners in the Hawkesbury Gazette Handicap (1500m) under the right circumstances. Nat King Cu ($14) showed a return to form with a game front-running third at Warwick Farm on April 11 while he’s hoping the blinkers coming off No Interest ($12) can spark a resurgence of her own.